Business today is totally dependent on IT for daily operations. How would your business cope if all IT services were suddenly unavailable? Even if a business wanted to gamble on it never happening to them, some have no choice but to develop a recovery strategy because auditors are frequently requesting business continuity plans as a compliance requirement. 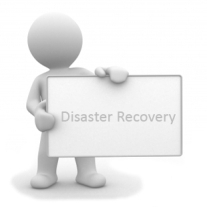 Our disaster recovery service starts by reducing the possibility of an IT disaster by reviewing your infrastructure and ensuring preventative measures are taken. Should the unthinkable happen and a genuine unpreventable disaster hits you, as part of your overall business continuity plan we can tailor the IT disaster recovery aspect to suit your needs and budget. Be it a live "hot site" mirroring your business systems or an inexpensive virtual infrastructure, you will have peace of mind knowing that your business has a proven, tested, updated recovery plan, that can stand up to the scrutiny of an audit by the Financial Regulator.